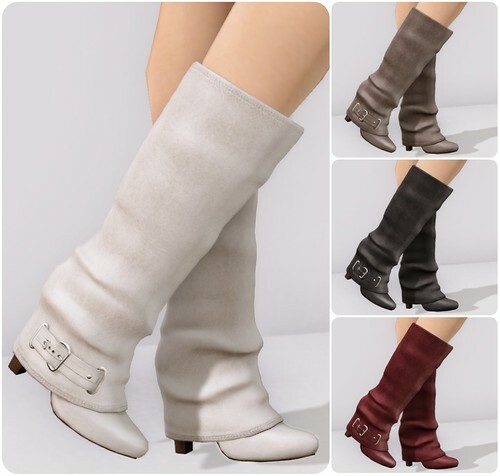 Elikatira released five new pairs of shoes! There are two different styles of boots, two flats, and a pair of pumps. I’m showing three of my favorite styles below; they have gorgeous textures and I love shoes with heels! Join the [elikatira] VIPs group in-world (250L to join) if you want to score some group exclusive gifts! There are some Move Pumps, Live Boots, and a pair of flats in exclusive colors for group members. I joined the group and was surprised at how many gifts were given. You receive 3 exclusive colors for the Move Pumps, 1 exclusive color of the Live Boots and 2 cute pairs of Millside Flats. Each pair of shoes include an alpha layer and invisi prim options. Amazing work! see this is why I read blogs, to see things I otherwise might have missed. and I would have :C if I missed these. Love the shoes so hard! I didnt even know she had an in world group :D.
I have been so frustrated with the shoes I am finding in world lately. These are GORGEOUS and priced very well. I bought way too many, and then forgot to join the group. Must do that today!